DEPTFORD TOWNSHIP, N.J. -- A state trooper who had responded to an accident scene along with several fire trucks and police vehicles was fatally struck by a passing motorist and died early Tuesday of severe head injuries. Sean Cullen was 31 and had been a trooper for about two years. Cullen had responded to an accident in the southbound lanes of Interstate 295 in Deptford Township at around 8:15 p.m. Monday. A car was on fire, and several fire trucks and police vehicles had their emergency lights on, state police said. He was walking near the crash when he was struck by a vehicle. Cullen was airlifted to Cooper University Hospital in Camden with severe head injuries. Family members and law enforcement officers held a vigil before State Police Superintendent Col. Rick Fuentes told them that Cullen had died at about 12:30 a.m. The 22-year-old woman who hit the trooper stopped and was cooperating with investigators. No charges have been filed. The investigation was ongoing. Cullen was a 2003 graduate of Cinnaminson High School, where he was a standout wrestler. He was born in Dublin, Ireland, and emigrated to the United States from Ireland in 1988. He was a 1998 graduate of Cinnaminson High School, and he was an All-American wrestler at Lycoming College where he earned a bachelor's in criminal justice in 2007. Cullen worked as a police officer in Sea Isle City and Mount Holly police departments, and was a patrolman for the Westampton Police Department in Burlington County, N.J., for two years. He is survived by his fiancé, 9-month-old son, mother, father, two brothers, and a sister. He was 31 years old. Gov. Chris Christie released a statement Tuesday offering his condolences. "Every day, the men and women of the New Jersey State Police put their lives on the line to protect our citizens. The sudden and tragic loss of New Jersey State Trooper Sean Cullen reminds us how fragile life truly is and the dangers police officers face daily on the job. As we mourn his passing, Mary Pat and I extend our heartfelt condolences to Trooper Cullen's loved ones and his New Jersey State Police family during this sad time." 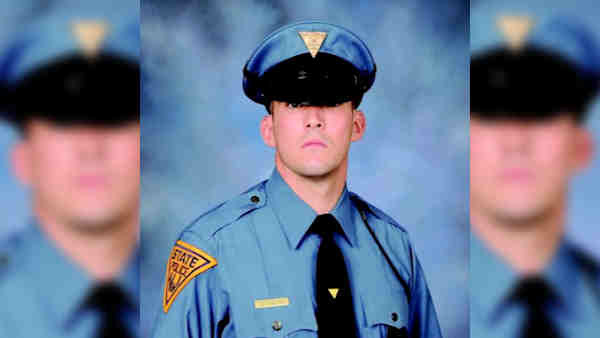 The last New Jersey state trooper to die in the line of duty was Eli McCarson. He was responding to a call in Salem County on Dec. 17 when his patrol car struck a utility pole. McCarson, 30, was trapped while rescuers in Quinton Township opened the jammed doors, and he died a short time later at a hospital.